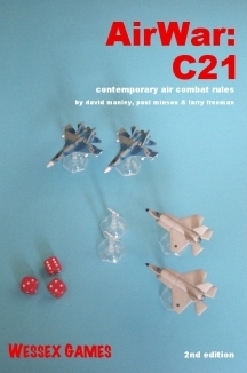 The second edition of our introductory modern air combat rules rules written by David Manley, Paul Minson and Larry Freeman for use with miniatures from 1/144th to 1/600th scales. 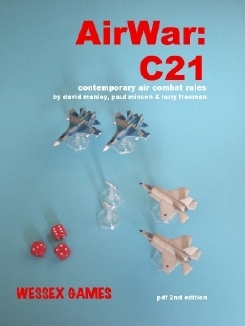 AirWar C21 (2nd edition) makes the complex subject of modern air combat so disgustingly simple that it is ideal for beginners and experienced gamers alike. After a couple of games reference to the rule book will become occassional with players concentrating on shooting down their opponents rather than ploughing through the sub-minutiae of clauses and appendices. Includes: Rules for aircraft characteristics movement, special manoeuvres, dog fighting and air-to-air missiles. Optional rules for ground attack, surface-to-air fire, spotting, ejection and crashing. ratings for 114 modern aircraft from the Chengdu Jianjiji-7A to the F-35B JSF, plus 92 AAM's, 59 SAM's, 5 gunpods, 72 anti-ground weapons and 26 AAA weapons. Pages: 48 A4 inc cover. Try it for free! 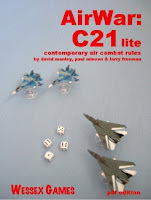 AirWar: C21 Lite is a downloadable PDF available exclusively from Wargame Vault. A stripped down version of the rules, AirWar: C21 Lite allows you to fight out dogfights between US F-14 D Tomcat's and Russian Su-27 Flankers. Includes: Stripped down core 2nd edition rules Stats for F-14D Tomcat and Su-27 Flankers. Printable counters of the aircraft in case you don't have the particular models. Pages: 13 A4 including cover. To download the AirWar: C21 Lite go here. 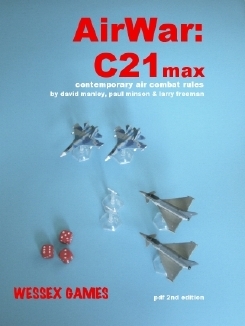 The AirWar: C21 PDF edition is a downloadable PDF of the AirWar: C21 (2nd edition) rulebook available exclusively from Wargame Vault. The text is the same as the paper edition, the only difference being the use of colour photos of models rather than the black and white photos inside the paper edition. Pages: 45 A4 including cover. To buy the AirWar: C21 PDF edition go here. 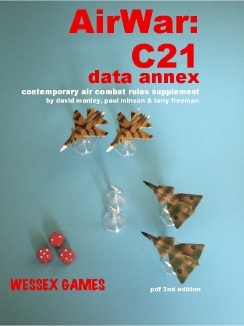 The AirWar: C21 Data Annex is a downloadable PDF supplement for AirWar: C21 (2nd edition) available exclusively from Wargame Vault. The supplement replaces the statistical tables in the standard rulebook with more aircraft, AAMs, bombs etc. Includes: Statistics for 358 aircraft from the IA58 Pucara to F-117A Nighthawk. Statistics for 112 AAMs, 10 gunpods, 120 AGWs, 81 SAMs and 44 AAA weapons. Pages: 41 A4 including cover. To buy the AirWar: C21 Data Annex go here. The AirWar: C21 Max edition is a downloadable PDF combining the AirWar: C21 PDF edition rulebook and AirWar: C21 Data Annex available exclusively from Wargame Vault. Pages: 65 A4 including cover. To buy the AirWar: C21 Max edition go here.